Last month our Club celebrated our Donald Ross heritage, and with good reason. We are the only Donald Ross designed course on the west coast. But in the last issue of the Blaster we reviewed for the first time ever, the first golf course on the property, the original Thomas Bendelow designed course that was here from 1912-1922. 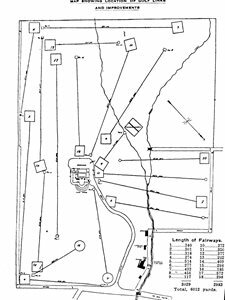 In this issue we complete Part 2, a brief summary of the most comprehensive historical review of the "lost" Bendelow course ever done. Last Month's issue ended after the first couple of holes. Take a look at the map. 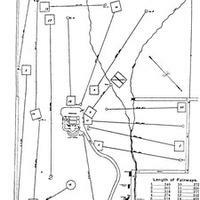 The first two holes are in the vicinity of number ten and eighteen. 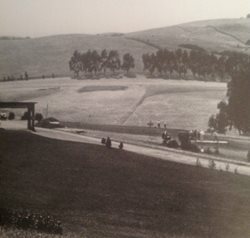 The third tee is near the Clubhouse and plays down Madera Road. The third green would be on the corner of Madera and Alameda de Las Pulgas. The green side photo shown is likely the corner green #3 but has never been truly identified. The next hole plays South and then two holes play uphill (along current #5). A hole so tough it made its way into the by laws (#7), played from the current fifth tee across the ravine to a "punch " bowl" green. # 8 played down the current # 2 fairway except there was an open creek at the bottom of the hill for your ball to run into and the green was at about the 150 marker. You then played a 117 yard par 3 to a green on the hill for # 9. The back nine was much of the same. The entire course measured just over 6,000 yards. Fairways were barely if at all indistinguishable from rough. The greens were good for their day. Bent greens with subsurface drainage. The hardest hole was no doubt the seventeenth hole. 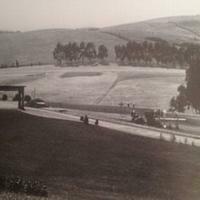 A 572 yard hole that started somewhere in our current 7th fairway and played straight uphill to a green just below the ladies ninth tee. When I began the quest of knowledge about our Club and course in 1989 I sought out our veteran Members. One man was Ed Thayer who had caddied at Beresford on the Bendelow course in 1919. He showed me the ridge of the old 17th green which had survived the 1922 Ross restoration. Ed Thayer also told me a story that has intrigued me for 25 years. 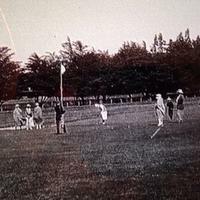 He told me that Harry Vardon had played Beresford and his older brother had actually caddied for him. Wow! Harry Vardon was an Englishman and the Arnold Palmer of his day. He famously lost to Francis Oiumet in 1913 in the US Open. But travel being what it is he made very few trips to the US. He made US tours in 1900, 1913, and 1920. I've tracked him to the West Coast, even playing in San Francisco. So far no Newspaper articles or British Journals (which chronicled his US tours) or photos have put him at Beresford. 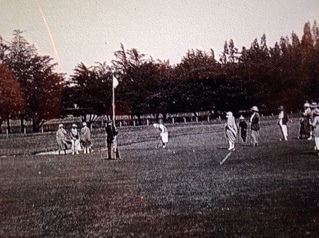 BUT I have now found another reference to Vardon and Ted Ray (his traveling companion) playing here on 2/22/1913. The reference states that is the date of the opening of the new clubhouse. The Big Clubhouse opened later, but the smaller temporary Clubhouse could have opened then. The date reference is anecdotal but is from a source other than Ed Thayer. My best guess? Vardon and Ray were here. What a day that must have been. Special Thanks to Nancy Stulack of the USGA Library for her help in accessing journals and photos 100 years old.